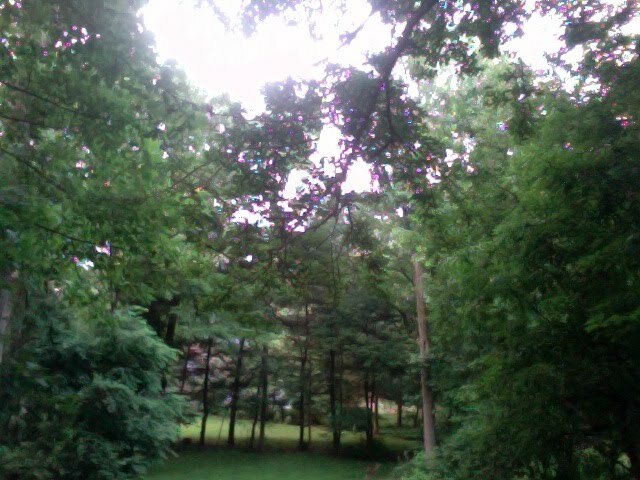 There was just a deer in the backyard. If you look closely, she is a blurry figure in the lower middle . . . can you see her? This is how I feel about my writing at this moment. I know it is there, but I just can't make it out . . . can't focus as I wade through boxes, looking for sheets, towels, a toothbrush! (Make that 5) But I know that it will come back as I find my footsteps again, get some sleep and start feeling at "home", appreciating the moments in between . . . my daughter and I having breakfast outside, looking at this view and her telling me with wonder, "I feel like I'm in a story . . ."
"Tell me the story!" I encouraged. "I need paper!" She insisted, and for the next while I searched for paper until she was distracted by something else, and unfortunately, I was too. Oh, that deer! She'll be back. For both of us! Congrats on the new house. Miss you in NYC. Love to the family, especially Scarlett! You came upon a beginning in the morning - one that is filled with hope, and clearer air, and promise of home in the country-ish place. You were watching as a little one and a Mom began their beginning in the fresh morning. And, as you continue to visit, you will embark on family connections, quiet reflecting and writing (please do not interrupt that) and many giggles. The summer will pass and in the Fall, the youngers will come home with many stories to tell. Listen carefully because this is a fantastic adventure for each of them. When the Winter comes, please leave your footprints in the snow so that they can be examined in awe. Thank you Arlaina and Courtney . . . and MaryJo . . . so beautiful! Literature is something that explains expressions and experiences of life. This blog describes the world of literature to us. When writers try write to write for college paper writing service are like deer in a forest that can be felt from very far but we can not see it properly. We can feel it s sharp nose and shining eyes only but when it come closer we can see it completely same is case with writers whether they are working on essay writing or other expression of writing.